Did you ever view photos that left you thinking, “Where is the pizazz? !” “Where is the wow? !” Boring! yawn…sigh…zzz. This is usually the result of photo mistakes such as poor lighting, distracting backgrounds, being off-center, too far away, etc., etc., etc.! To complicate things even more, now try taking a photo of a squirmy-wormy pet pooch that doesn’t give a hoot about your efforts to get the perfect shot. It can be tough! #1 rule is to keep it fun! Dogs are great at sensing our energy. If you become irritable due to your pooch not sitting still, your dog can feed off that energy and be inclined not to cooperate. Having trouble getting your dog to sit still? Before sitting your furry model in front of the camera, take him for a walk, run, or other energy expending activity. A dog with pent up energy will be far too wound up to cooperate for those great shots you are after. Dogs have a knack for looking the opposite direction as soon as you whip out the camera. 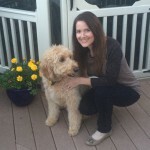 Use the “sit” and “stay” commands, then use a treat to get your dog to look in your direction. It will appear as though he is willfully gazing into the camera for that perfect pose. Of course, a bunch of shots with your dog sitting still can become awfully boring, so you will need to get creative. Think of the things your dog does that are extra adorable, and somewhat predictable, so you can have your camera at the ready. My dog does a stretch every morning when I let him out. One morning I was ready for him, camera in hand, and got the most amazing shot. Sometimes it is easiest to get fabulous shots by just letting them do what comes naturally! Get photos from a dog’s eye-view. Some of those adorable face shots come from getting down low. Aiming to be at a dog’s eye level usually works best, but who says you have to follow the rules? Most photos these days are taken with camera phones, nothing fancy at all. And with all the editing apps out there, many low quality photos can be transformed into something pretty spectacular (especially to the average eye). Some apps that I’ve tried are Photoshop Express, Aviary and Snapseed, but there are many more! Lighting, lighting, lighting! Whether an artificially lit room, or natural lighting, it can make all the difference in your photos. In addition, using a flash can sometimes create glowing eyes, so be sure to have light! Want some spontaneous, good-natured, fun poses? I like to get my dog excited to where he is jumping playfully, then take photos of the action! Often, he sticks too close to me so I throw a toy and snap photos of him on his way back. Or, I chase him around then suddenly stop, and wait to catch photos as he comes running back to beg for more. It may sound funny, but it works! In addition, taking a burst of frames by holding down the shutter button on a camera phone works well to capture action. Fill the frame with your subject matter (your dog) by using your zoom, that way you can eliminate most of the background and put the focus where it belongs. It can be equally interesting to photograph just a portion of your dog. My dog has fantastic eyes and I like to zoom in close to show them off. But, let’s face it, just about all parts of a dog are pretty darn adorable, so zoom in close and capture those ears, paws and tails! In this digital era, we have the advantage of being able to snap multiple photos while not wasting film! Make it a habit to snap repeatedly even if you feel like you got a great shot on the first try. It’s amazing when comparing each photo later on how many different expressions a dog can appear to have! The wind may blow their hair in different directions, they may have closed their eyes, cocked their ears, stuck out their tongue, raised their tail…in the end, any of these things can make a huge impact on the look of the photo. There is nothing more annoying than getting a great shot of your dog only to realize he was sitting next to that pile of dirty laundry you were planning to do. Ugh! Be aware of what will appear in the background of your photos to prevent them from being rendered useless. In addition, don’t place your dog in front of a background of the same color, or he will be washed out. Patience. Can’t think of an adorable way to pose your dog? 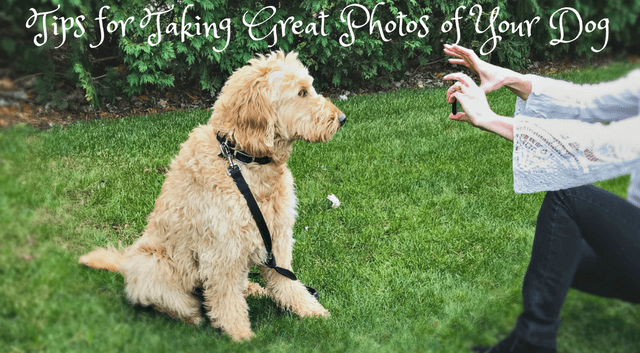 Can’t get your dog to behave for the shot you want? Let your dog be a natural model, be patient, and snap a photo when you see something you like! For every photo I take, I look at it as if it were someone else’s, and ask myself the question, “What would I think of this?” This helps me determine if I should keep the picture, or try for another. But, that said, I’m never too hard on myself, after all, photos are for fun! And what is special to me is worth keeping regardless. I have two big dogs, a German Shepherd, and a labrador. Both are cute and photogenic, but the problem is that I have never succeeded to make a decent picture of them! It’s about time now to get nice shots, so I will follow your suggestions, hoping it will succeed this time:). I’ve just discovered your site, and I found it fascinating! Best of luck to you in snapping those perfectly cute shots! Dogs are so naturally adorable that you can hardly go wrong. Thanks for stopping by and commenting! What great information you shared with us, I am inspired by the method for the stage. Keep doing awesome. Thanks for sharing this blog article.